A collection of Roman remains will be on display at Grouville church to mark the opening of its new extension. The artefacts were unearthed during excavations for the building work. 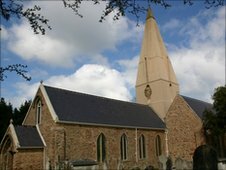 It is the first extension to be built onto a Jersey church for decades, and the work meant digging down into an old part of the cemetery. While contractors were working on the new extension, they found not only old bones but significant signs of Roman occupation. There were strong foundations extending several feet into the earth. They were mapped and investigated before the site could be built upon. Archaeologists also found remains, proving there were Romans living on the site about 2000 years ago. The Rector Mike Lange-Smith said it was fascinating to learn about the history of the parish church. The artefacts will be on display from Sunday for the parish Plough festival. The Bishop of Winchester will come to the island for the service, and to open the new extension.